Stainless Steel SPB SSGE.FW Series are made up of sliding contact surfaces of steel against steel and also steel against brass. We offer these bearings spherical plain bearings in sealed and unsealed and therefore some maintenance and some don't, the maintenance is in terms of re-lubrication from the sides of the ball. 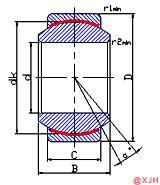 Their design makes them particularly suitable for bearing arrangements where alignment movements between shaft and housing have to be accommodated, or where oscillating or recurrent tilting or slewing movements must be possible at relatively slow sliding speeds. The Stainless Steel SPB SSGE.FW Series offered by us is obtainable in customized option, as per the varied needs of our customers. Moreover, our product is available at cost effective prices. Our entire product range acclaimed among the clients for durable standards and has high quality. 1, Material: both inside and outside the circle of stainless steel. 2: inner quenching, heat treatment. 3, structure of products: extrusion; no oil groove oil hole. 4, both inside and outside the circle of the middle layer of PTFE sintered copper network.